Woke up around 515 and went back to sleep for about 40 min. I felt so sore from yesterday and my knees felt stiff. I eventually got up because I was too hungry, and I wanted to leave an abundance of of time to be slow over the kinsmans. I hobbled from my tent up an annoying hill to the privy. Then I sat by the bear box and ate breakfast. Cosmo was there, which I didn’t expect, and a little while later, floater emerged from the shelter. I assumed she and the guys had kept going because the snoring person behind my tent turned out to be a rangy fellow I’d never met. Floater and I remarked on the efforts of yesterday, and I tried to work out some of the stiffness in my angry right knee. After breakfast, I put on my sweaty clothes from yesterday and deconstructed my tent. 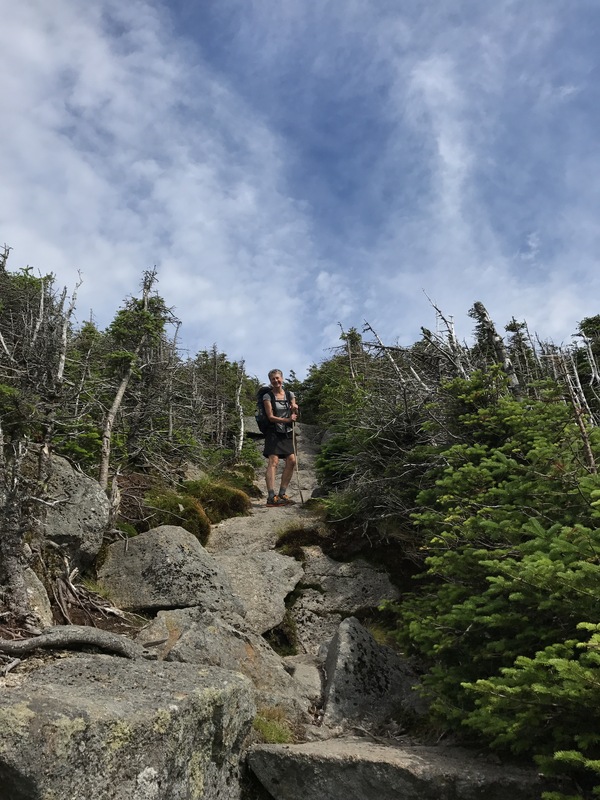 I couldn’t imagine how I was going to muster the energy to climb another mountain as I stuffed things into their designated places in my pack. I went back to the eating area to find that guy and mantis awake and talking about how their bodies managed yesterday. They’re all planning to make a town stop, which will likely result in the lure of staying in a hostel for the night, so this will likely be the last I see of them for who knows how long. I hung out a bit. Then Walden and I went down to the stream to get water. She was equally tired from our nearly 17 mile haul. The stream met up with the trail slightly north of the shelter turn off, so after filtering, we both crossed the stream rather than go back towards the shelter to get on trail at the exact point from which we departed. Little omissions like that are fine with me. I’m pretty sure I will still be a thru hiker if I miss a few yards here and there. The trail followed Eliza brook for awhile. I felt anxious about the “tricky rock hop” that my app forecasted, so I peered around every corner waiting for the crossing. When it finally came, it was your run of the mill effort. Maybe it’s harder when the water is higher? I don’t know why I get so worked up about these things. It doesn’t help me get through the scary thing any more than worrying ever helps. 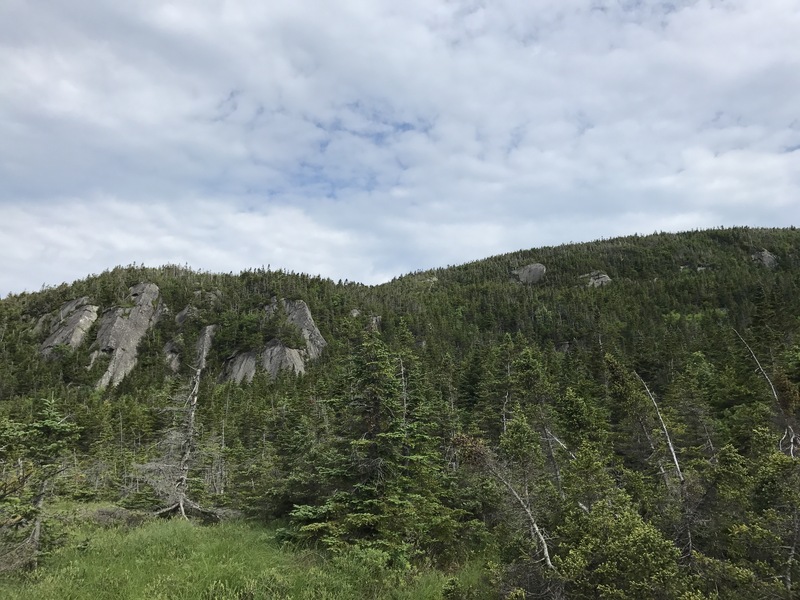 Eventually the trail began to climb South Kinsman. Walden and I ended up hiking together nearly all day again. We crossed through a boggy area with interesting cliffs in the distance. Then more climbing that became incredibly steep. Here are a few shots heading up the mountain. In the first one you can just make out a teeny tiny Walden sitting at the top of the frame. The rocks wound up and around every corner with no apparent end in sight. Around 1030 I stopped to take a break and eat a snack in the middle of the “trail.” Walden continued on but we met each other again not that long after my break because she sat on the rocks waiting for me to come around the bend so she could take my picture. I did my best not to look behind me for most of the climb because it made wobbly to see steepness of the grade from above. Best to just look one step ahead. We eventually came to area near treeline that gave us incredible views of the surrounding mountains. Here’s Walden on a couple of the exposed boulders we had to climb. The view from the peak was similar to what we’d seen for the last 20 minutes (today’s top pic), so we didn’t stick around for long. On to north kinsman we went, which was a mercifully easier climb than south kinsman. I dropped my pack at the intersection for the short side trail to the view because I didn’t feel like taking it down the short climb. 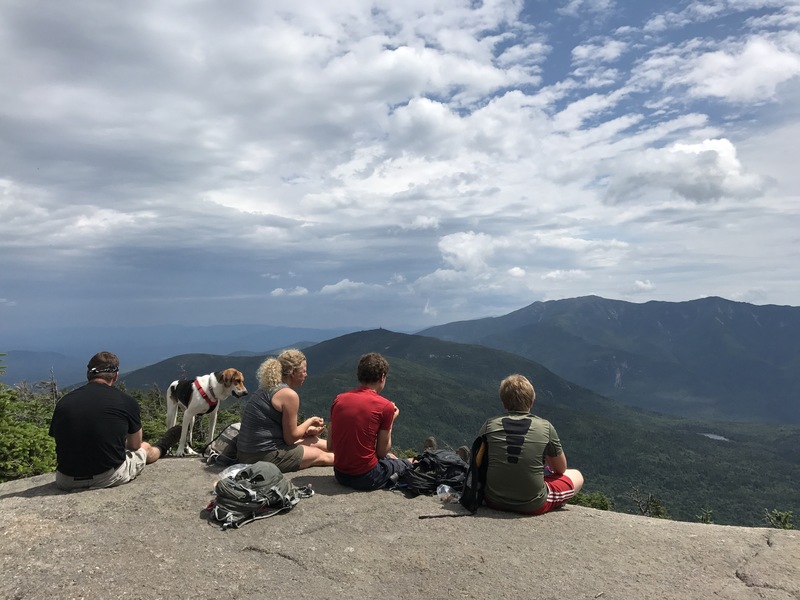 A family of 4 and their dog sat at the edge of the boulder facing Franconia ridge. Walden and I sat down beside them and took in the expansive view. I ate the fruit leather I’d grabbed from my bag and asked the mother of the family about the ridge and tomorrow’s weather. 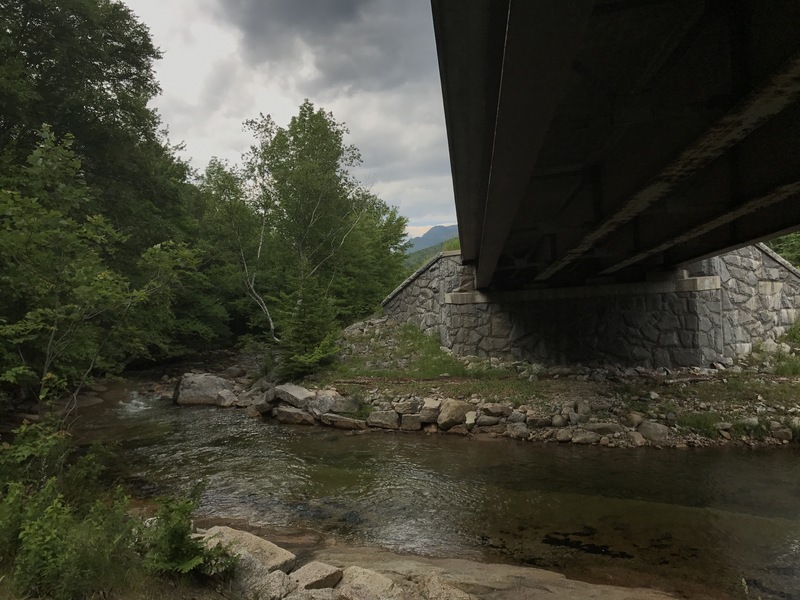 They’re out working on the 48 peaks over 4K in NH. I think north kinsman made number 21 for them. Walden took their picture with a sign naming the mountain. 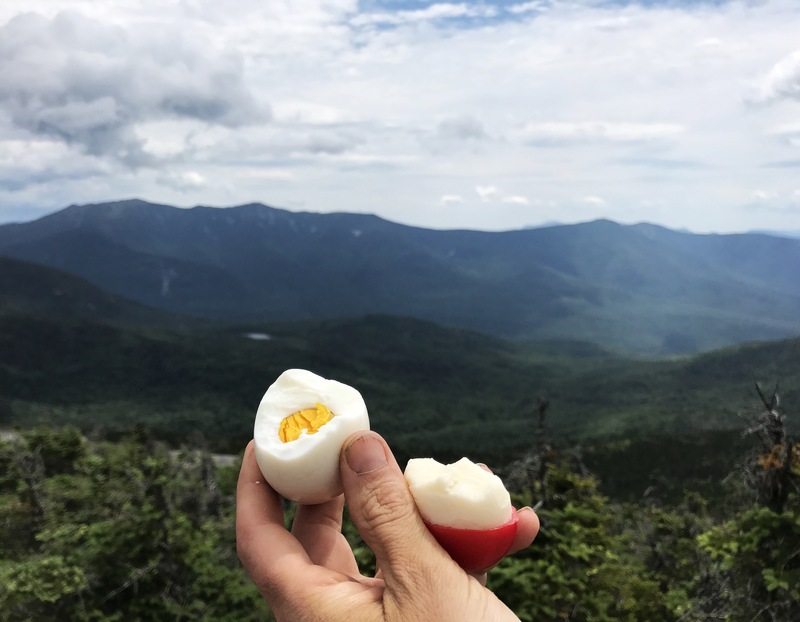 Then the mother offered us hard boiled eggs, which I accepted with glee because it’s one of my favorite hiking snacks and I happened to have a babybel cheese left to accompany it. I ate my trail magic and basked in the sunshine feeling excited for the ridge and apprehensive about the predicted chance of thunderstorms for tomorrow. I started formulating a plan to take a zero at liberty springs campsite as a backup option to racing bad weather. After about twenty minutes of lounging, I forced myself to get back to walking. I dreaded the long descent from north kinsman. 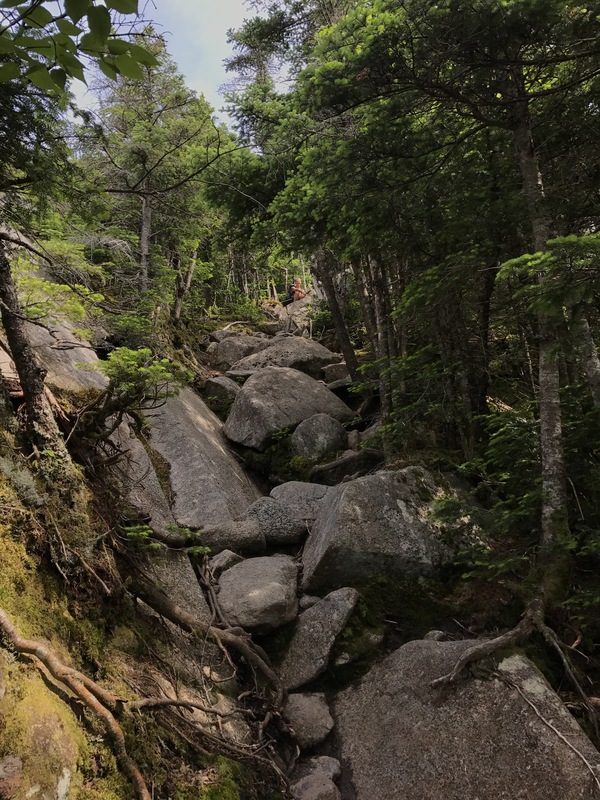 The family said the trail wasn’t sheer boulders and that there were steps cut into the rocks. Of course, we came to open faced rocks with no apparent steps almost immediately. 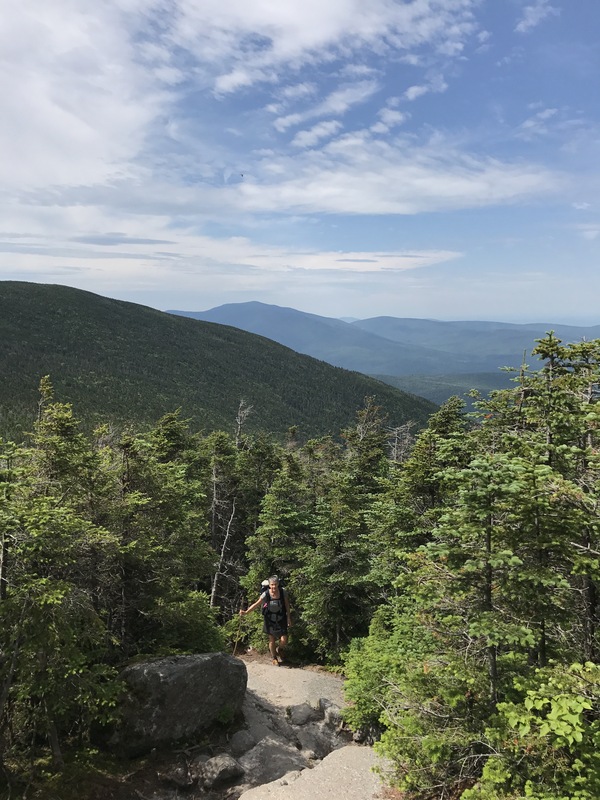 I made a sarcastic remark about asking people from NH about terrain, but we did eventually come to a few places where there were steps and assistance for navigating the steeper sections. The egg snack buoyed my energy level for awhile as we picked our way down the mountain. My intention had been to eat lunch at the hut to stretch my lunch food another day. As time went by, I got hungrier and felt increasingly harried. I should have stopped and eaten, but I stubbornly stuck to my plan. This resulted in being nearly inconsolable by the time I got to lonesome lake hut around 2pm. I dropped my pack at the foot of the stairs, grabbed my wallet, phone, and water bottle and rushed inside. The huts cook a different soup everyday for hikers to buy for $2 a bowl during the daytime hours. I asked for the day’s offering of split pea soup. Walden and cosmo arrived a few minutes later. I kept my head in my bowl and ate with a singular goal: return to human form before biting someone’s head off. Walden began deliberating about where to stay the night. She needed to get to town in order to buy food, but she had missed the shuttle for a nearby hostel. I didn’t have the patience to weigh in on her ambivalence. I felt dedicated to my plan to continue on to liberty springs, so I spent my time bouncing the idea off of some of the hut staff. With nearly 6 more miles to go and the hour approaching 3p, I left Walden to make her decision and continued on alone. Ominous clouds hovered over the nearby mountains, which made me feel even more intent on leaving as soon as possible. I left the hut feeling torn about not sticking with Walden. 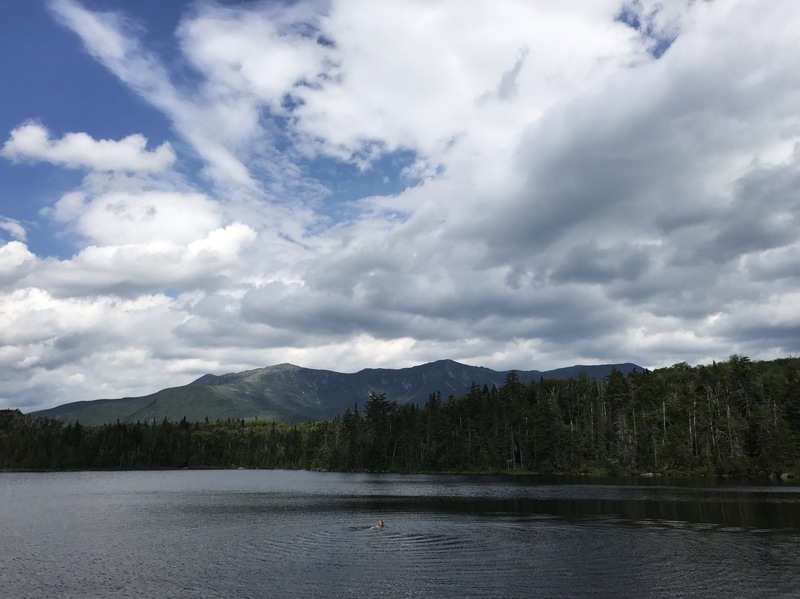 I didn’t feel like spending the money to stay in town, and I wanted to get more miles out of the way with decent weather, both of which conflicted with her options. I felt okay being alone, but disappointed to not know when we might meet again. The trail led me down to lonesome lake, which is surrounded by incredible mountain views. A lone woman swam in the middle of the lake as others sat by the dock gawking at a family of ducks. I followed the boardwalk around the edge of the lake and took a right towards liberty springs. 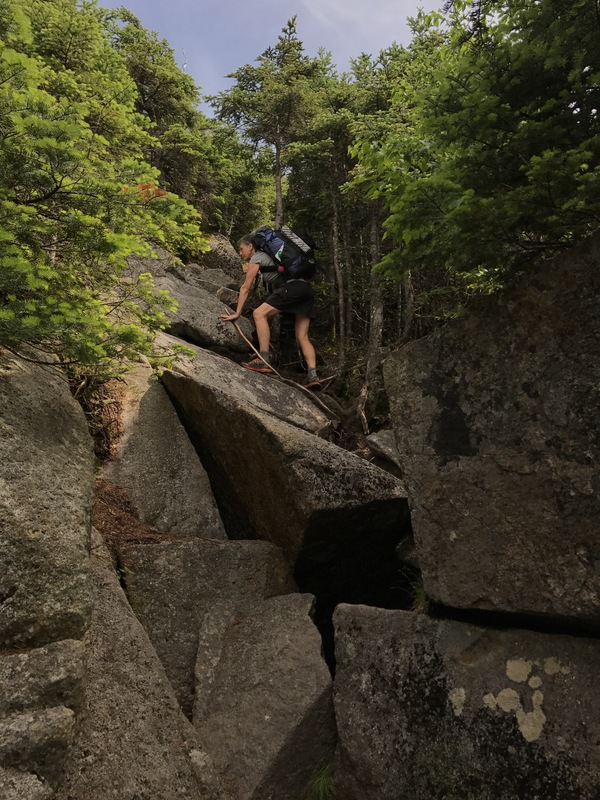 I felt anxious about the unknown climb ahead of me (will it be boulders that slow me down to a crawl? will I get to camp at 8p??) and the potential for rain, so I walked as fast as I could. 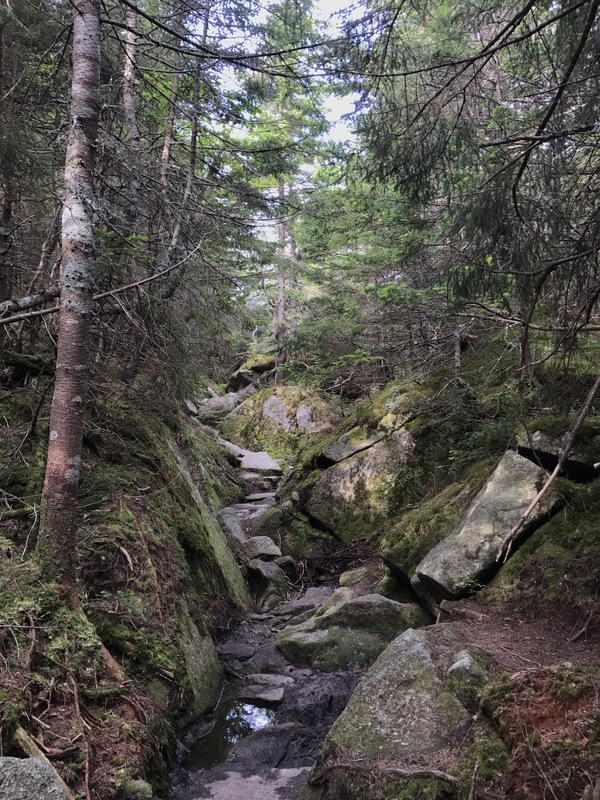 The trail followed alongside cascade brook with one major crossing of it that required a rock hop. A woman sitting at the brook shrugged and said it would be fine when I commented on the dark clouds overhead. I said, “you must be from NH!” She laughed and said that she was indeed. After the brook, the trail evened out to easy footing and fast walking on a gradual downhill to the interstate. I got a little confused at the road, but finally figured out that the trail goes under the overpass and continues straight. At first I thought I was somehow supposed to cross back over cascade brook which was rather wide at that point. Glad I was wrong about that. The trip up from the road consisted of an actual trail for the first mile and a half. I felt so relieved to not be inching up and over boulders. I continued to walk as quickly as I could, making decent time and sweating bullets in the humidity. I took one short break to eat a snack and rest my feet. The trail steepened and became rockier about a mile south of the campsite. I sighed to myself and just kept inching my way up the mountain. I made it to the campsite about an hour faster than the info sheet at lonesome lake predicted. Liberty springs is one of the AMC run campsites that has an onsite caretaker and costs $5-10 depending on several factors. The site straddles the trail, with tent platforms to the left and the spring and cooking area/bearboxes to the right. The caretaker for liberty springs turned out to be incredibly helpful and approachable. When she showed me to my wooden tent platform, I asked for advice on effective knots to tie off my guylines since I don’t have a freestanding tent. As she went through a few useful knots, she professed her perfectionism, and I professed my ineptitude, which resulted into her basically setting up my tent for me. I have good spatial reasoning in a lot of contexts, but when it comes to knots, my brain goes haywire. They just don’t compute. I felt sheepish asking for so much help, but I also didn’t want to have my tent collapse on me in the middle of the night, especially a night that may involve rain. 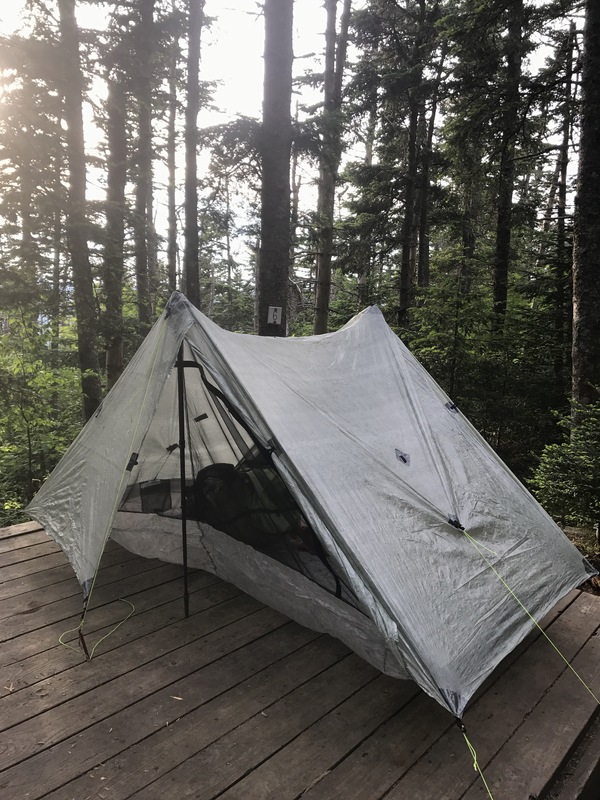 As we (she) set up my tent, we talked a bit about her experience as a wilderness therapist. She laughed and seemed excited when I told her I am a therapist. The caretaker left to continue overseeing arriving campers,and I grabbed my food to eat dinner in the cooking area. Because of pesky and aggressive bears, campers are required to only cook by the bear boxes. I felt unenthused by the forced socialization, but followed the rules and muddled through dinner conversation with a couple of SOBOs while two different youth groups milled about making a ton of noise as they went through their dinner routine. One of the SOBOs seemed quiet and intriguing. The other one was boisterous and way too energetic for my desired output at the moment. Of course the quiet retreated as soon as he finished eating, leaving me to be the primary receptor of the outsized personality of the other SOBO. Another hiker out for a several-day loop offered me trail mix in the hopes of lightening his pack. I happily agreed to take some to assist in my goal of not resupplying the entire way through the whites. 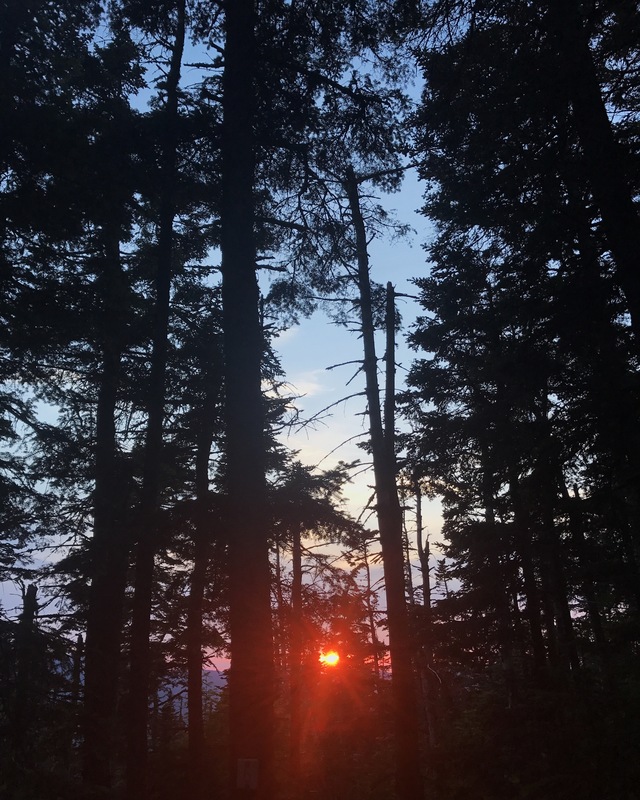 The caretaker mentioned at my setup that walking up to mount liberty for sunset was a popular option for people who stay at the site. I considered doing it, but I felt exhausted by the time dinner was over and couldn’t fathom walking 1.1 miles roundtrip on top of what I’d already done for the day. I regretted my decision as the evening light went from orange to the blazing pink of an insane sunset. At that point it was too late to head up, so I cursed myself and gawked through the trees while I filled my water back at the spring. I heard my name, and turned to see that guy frantically searching for the caretaker. He, mantis and floater had just arrived after a frantic hike up from the road. 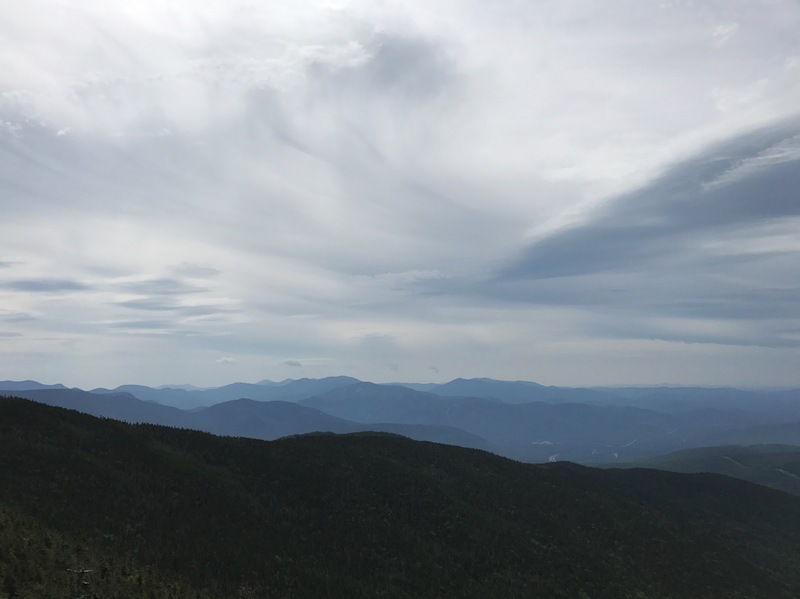 I assumed they would get caught in the vortex of town food and a hostel, but they got a late afternoon hitch back to the trail after their town stop and rushed up the mountain to camp at liberty springs. Floater seemed exhausted and out of sorts, hurrying through her tent set up because she was so tired and hungry. I can relate. We talked while she set up, and I took a dozen terrible pictures of the incredible sunset through the trees. I could make out the Kinsmans in the distance, which felt crazy because I had been standing on those mountains just a few hours before.